This article will teach you how to prune a blueberry bush. 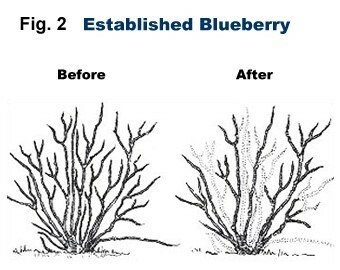 If and when you prune a blueberry bush will depend on it's age and how it was grown at the growing nursery. 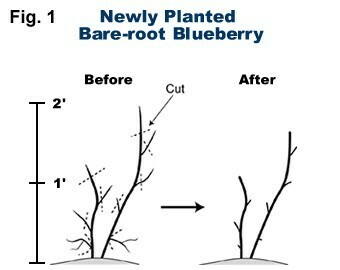 Plant bare root blueberry bushes while the are dormant, before new growth begins to emerge in spring. At planting time, prune the bare root plant back 1/3 to 1/2. Remove low twiggy growth entirely and tip remaining shoots to remove all the flower buds (Figure 1). After rabbiteye blueberries have established themselves they require little pruning until they reach about 4 to 6 feet in height. In general, it usually takes a blueberry plant 4 years to reach this height. At this point, a cane renewal pruning program should be started. Each winter, using a sharp pair of hand pruners, remove one to three of the largest canes, cutting them off at 0 to 24 inches from ground level, or a total of about 20 percent of the canopy (Figure 2). In areas where stem borers are a problem, make the pruning cuts at 24 inches. Do this over a period of five years and your blueberry bush will be totally renewed. New, more productive canes will sprout from the old canes and will sprout below ground level. In addition, excessively tall canes can be pruned back to 6 feet each winter.